It's so difficult to keep up with Hanayama and its Cast puzzle series these days that, if you blink, you might miss one of their puzzle launches. My collection in only briefly completed for just a few months, up until yet another Cast puzzle is available. 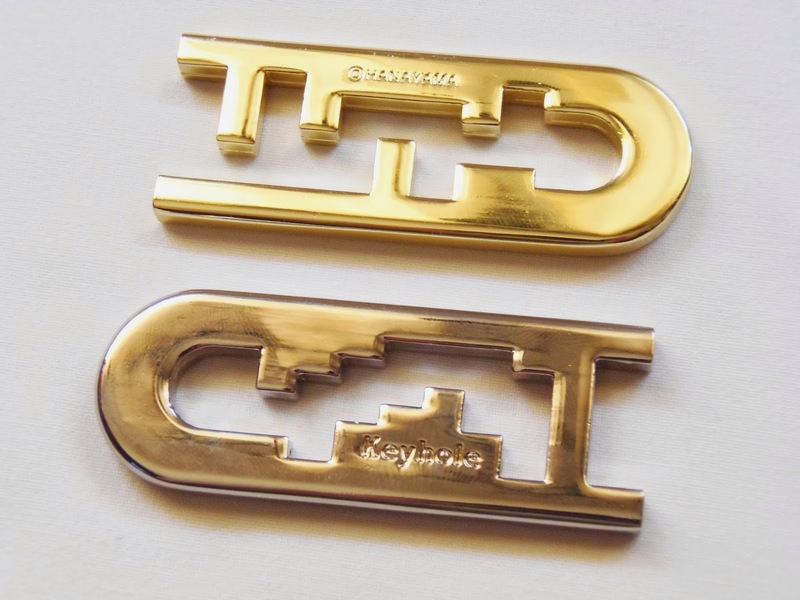 One of Hanayama's latest releases, in January this year, is the Cast Keyhole, designed by the Finnish Vesa Timonen, who also created other Cast Puzzles like the Cast Square, the Cast Loop, the Cast Donuts, among others. The theme for this puzzle is "Groove". Built in the shape of a keyhole, the puzzle is basically a 3D maze comprised of two intertwined pieces that should be separated and then rejoined in their original position. Rated by Hanayama as a level 4/6, you will face a nice challenge with the Cast Keyhole, even though it never gets frustrating enough to give up on it. Quite honestly, at first, when I looked at this puzzle I could bet it was designed by Oskar van Deventer. It just seemed like a puzzle Oskar might design, given his many other creations involving 3D mazes and labyrinths. Nevertheless, despite who designed it - credit to Vesa for a great concept - the puzzle is a typical Cast Puzzle in the sense that it follows every design characteristic made famous by Hanayama, like the perfect and flawless quality, presentation, and intriguing concept. 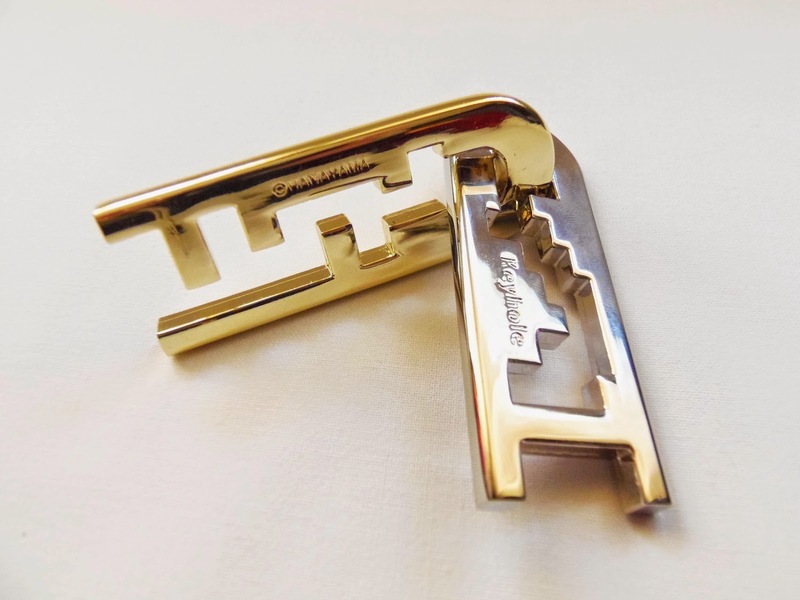 Beautifully made in two contrasting colors, silver and gold, as done many times with other Cast Puzzles, the quality, however, is actually even better than previous puzzles, because the thick coating doesn't scratch that easily - a big plus for every Hanayama aficionado. I have a few Cast Puzzles that are heavily scratched because of the quality of the coating applied. I guess Hanayama learned from their mistakes. 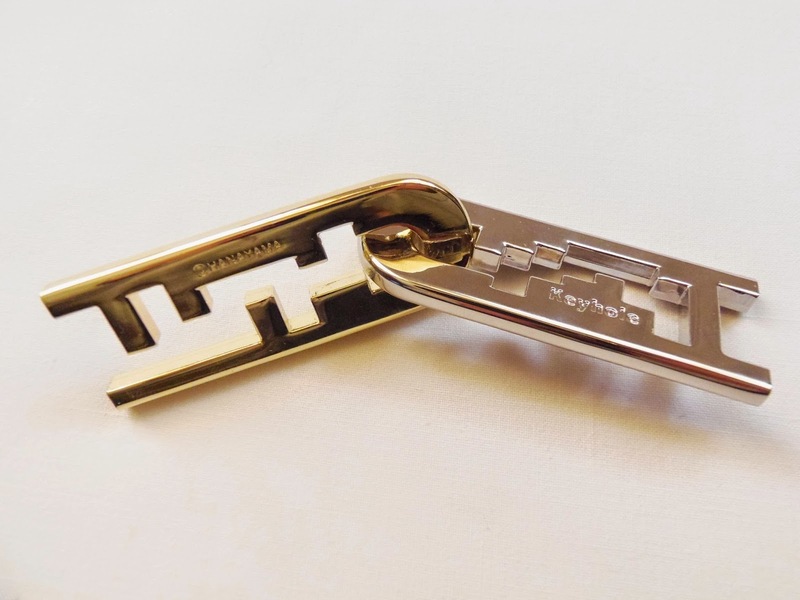 The Keyhole is moderately difficult, as any 3D puzzle should be, but with just a little patience it's possible to solve it within 10 minutes on your first attempt. You will encounter several dead-ends as you navigate through the maze by twisting and turning the two pieces. The puzzle is equally difficult to put back together, as the maze is tough to memorize. The Cast Keyhole by Vesa Timonen is definitely a great addition to the Hanayama family and a worthy purchase if you like Cast Puzzles. Along with its stunning design, the puzzle also offers a good amount of thinking with its unusual maze. Availability: I got my Cast Keyhole from PuzzlesdeIngenio.com. Wordwide shipping available. Check out the others in the Cast Series. Twisty Puzzles - I love to collect them, but as much as I'd want it, I'm not very good at solving them. I can solve a traditional 3x3x3 Rubik's Cube with some algorithms, a 2x2x2, of course, and maybe a few more variants that are similar in difficulty, but that's it. When things get more complex, though, I just like to admire them for what they are and won't dare venture further. The Pocket Cube is a perfect example of "looks can be deceiving". At first glance, it looks like a regular 2x2x2 puzzle with a smaller cube fused within one of its corner pieces. The reality, however, is that the puzzle is far from a simple 2x2x2. It's actually a 3x3x3 puzzle disguised with bandaged corner pieces. The puzzle also shape-shits in other unusual forms by simply turning and rotating it a few times on its axis. 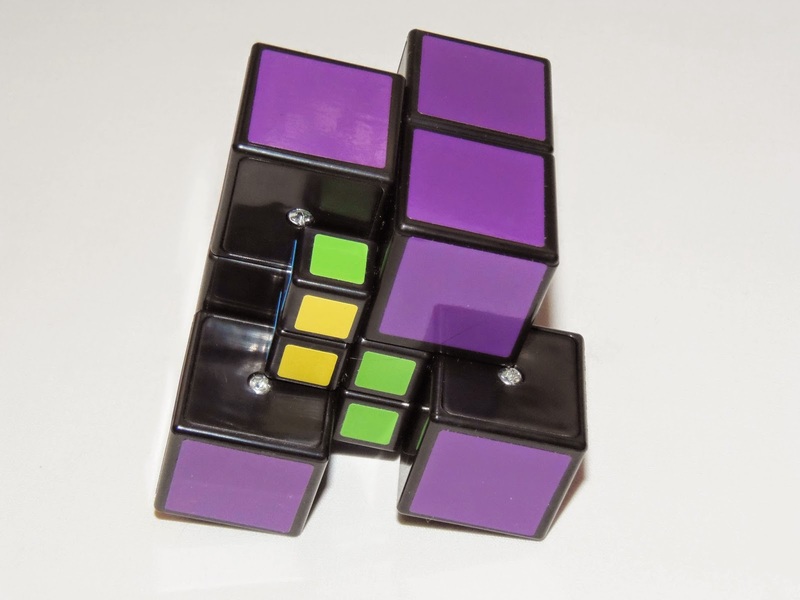 This puzzle is yet another great Twisty Puzzle manufactured by Meffert's in collaboration with the original designer, here beautifully made with purple stickers for the main cube and blue green yellow for the smaller cubies. It turns very well, but with a little bit of lube it might be even better for speedcubing. The Pocket Cube can be solved into different states, so for better or for worse, there's lots of different solutions for you to try. As for me, I'll just keep it on my Twisty Puzzle shelves to keep the others company. 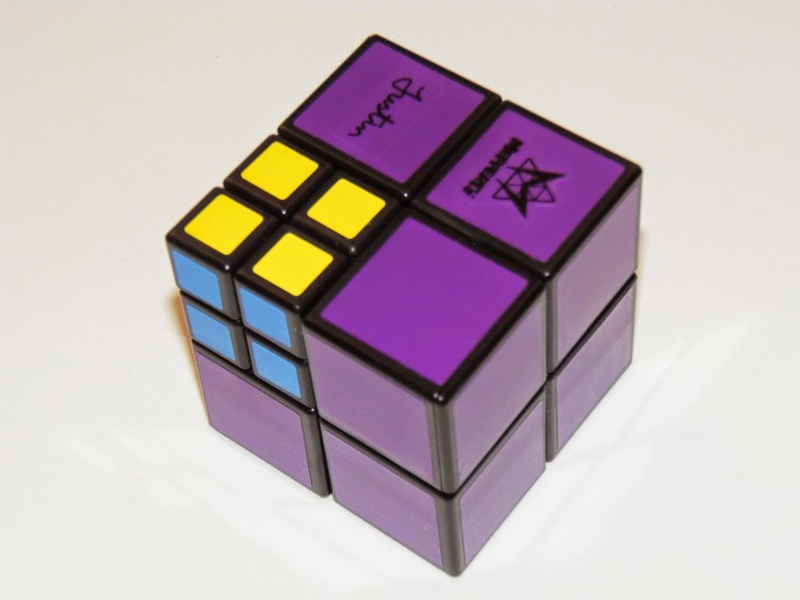 The Pocket Cube is a great addition to any Twisty Puzzle collection, whether you can solve it or not. If I were to get only puzzles that I could solve, I would have only a fraction of my current collection. It does look stunning among the others and really stands out. 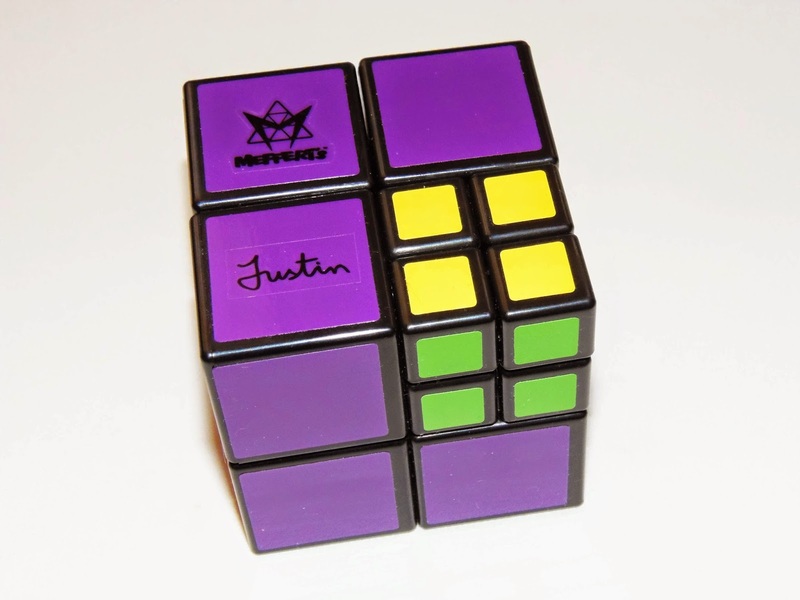 Availability: You can get a copy of Justin's Pocket Cube at PuzzleMaster for about $20 CAD. Click here for other Meffert's puzzles. Role playing is part of our childhood. We all have done it in the past, but as we grow up we forget how fun these activities were...Until we get an excuse to let the kid in us run free and explore other possibilities. Cops and Robbers has always been a popular choice when it comes to imagining a different reality, and Raf Peeters, once again, succeeds in delivering a great game made by SmartGames. 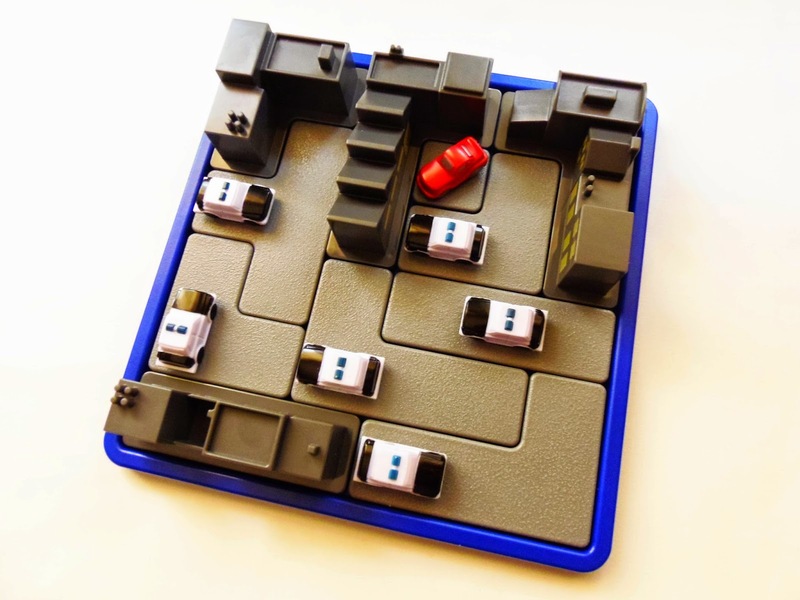 Road Block is a packing puzzle with a twist, where a seemingly possible arrangement might not always be the correct solution. 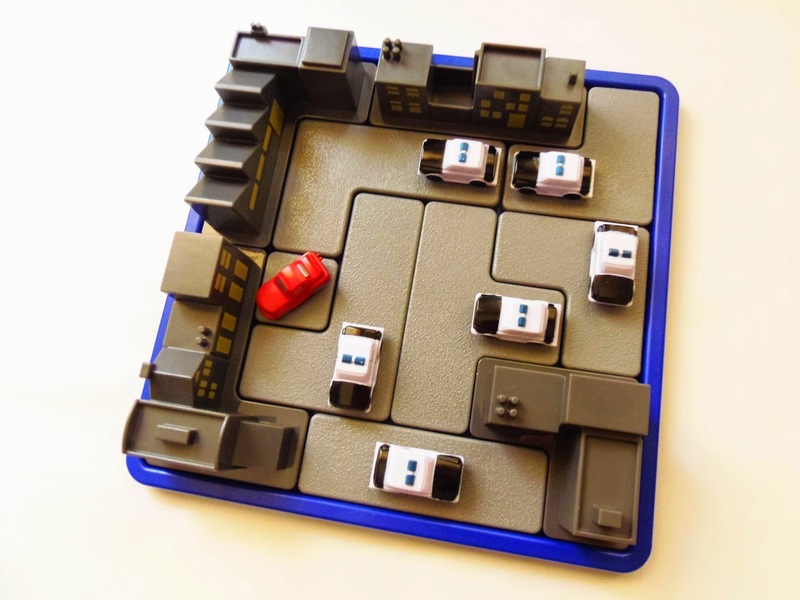 It's up to you to use logic and strategy to find a way to block all escape routes of the gangster's car and become the smartest policeman in town. Are you up for this demanding task, Officer? The goal of the game is quite simple to understand, but it can get pretty tough as you advance to ever-more difficult challenges. Road Block consists of 11 pieces, although only six are part of the challenge itself. 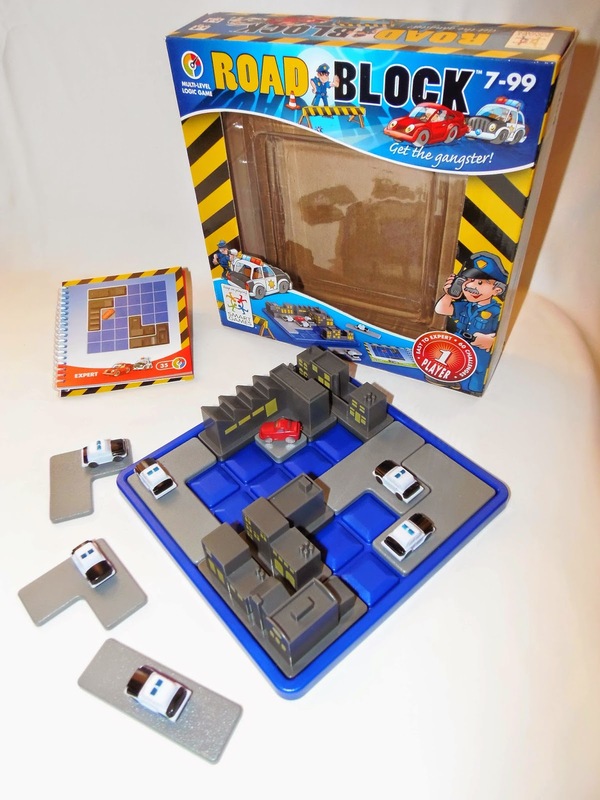 In other words, you will only be moving the six pieces with police cars in order to solve each challenge. 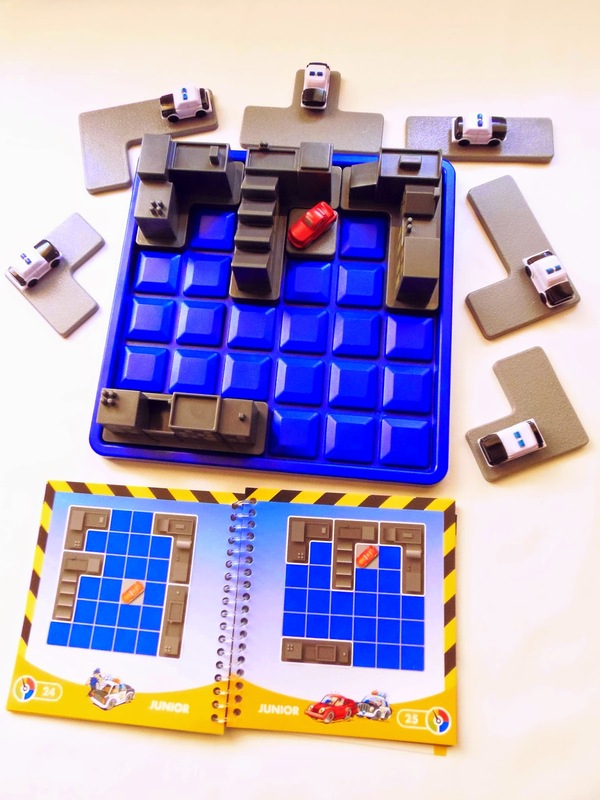 You start by rearranging the building blocks into the corresponding places as shown on the game booklet and position the red car in its starting spot. The real challenge begins next, as you try to pack all the six pieces with police cars in the remaining empty spaces. 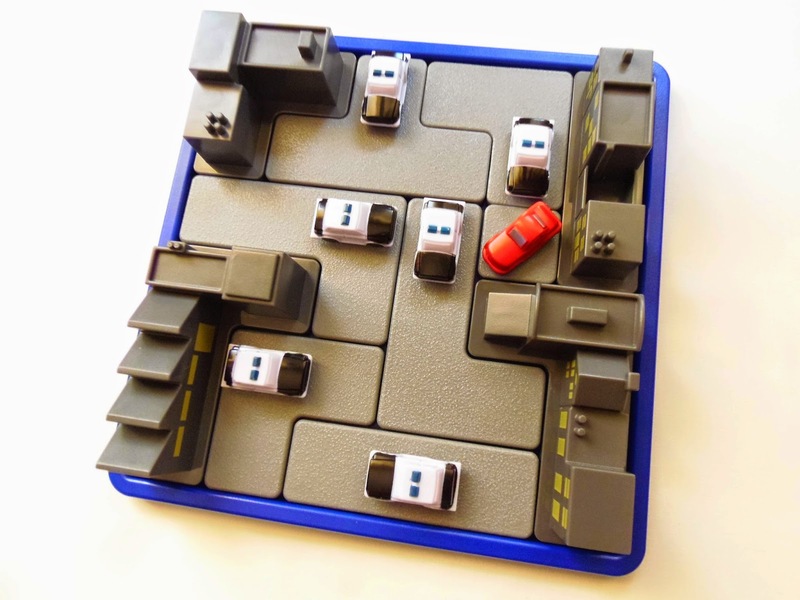 You have to use all six pieces, even if you think the red car is already blocked with four or five pieces. I found that placing all the pieces in the game board isn't the most difficult part - That's easy, as there are countless ways to do it. The pieces are shaped as known polyominoes, as used in other packing puzzles, with a mixture of Trominoes and Tetrominoes. 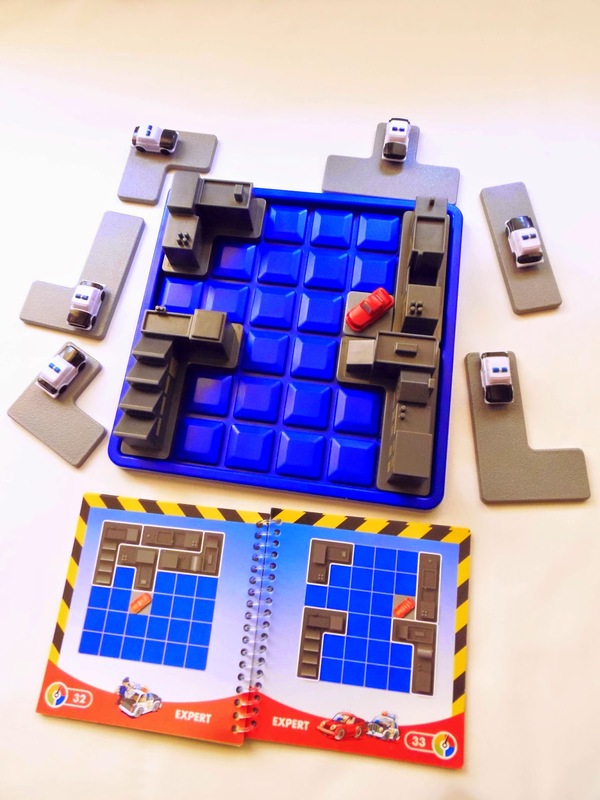 The challenge, however, lies in finding a way to use those pieces in an efficient manner to block all exits for the red car. There is only one solution in each challenge, which complicates things on the harder difficulty levels. The game can be quite challenging, but I reckon the difficulty levels can be deceiving. There were several times when I spent more time on a supposedly easier challenge than on a harder one. It depends greatly on how you tackle each challenge, and how lucky you are to find the correct solution earlier. 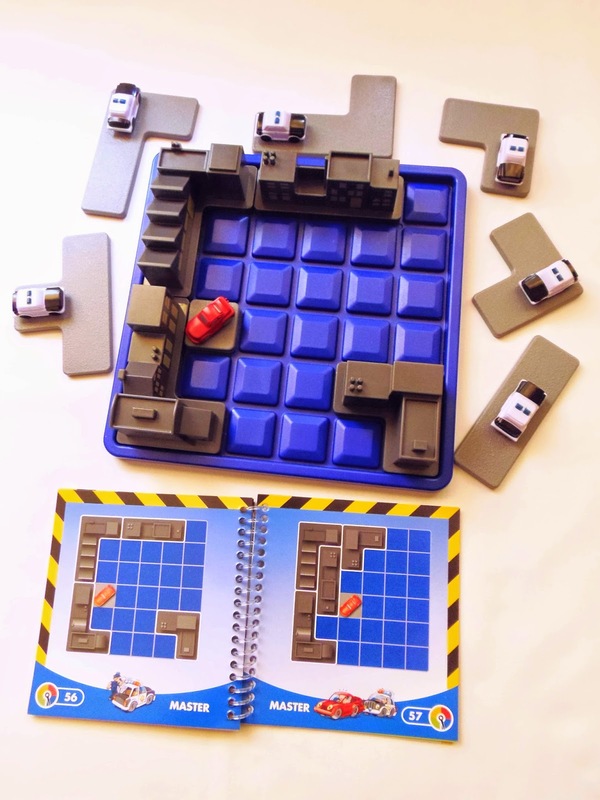 But, as pointed out in the game booklet, you shouldn't go at it head-on by trying to pack the pieces right away. Stop > Think > Plan > Execute. And you'll be able to solve any of the 60 challenges. Availability: To get a copy of Road Block by SmartGames, you can visit Amazon.com, Amazon.co.uk, or any other Amazon website near you. The Babylon Tower, the Missing Link, the Whip-It...What do they all have in common? 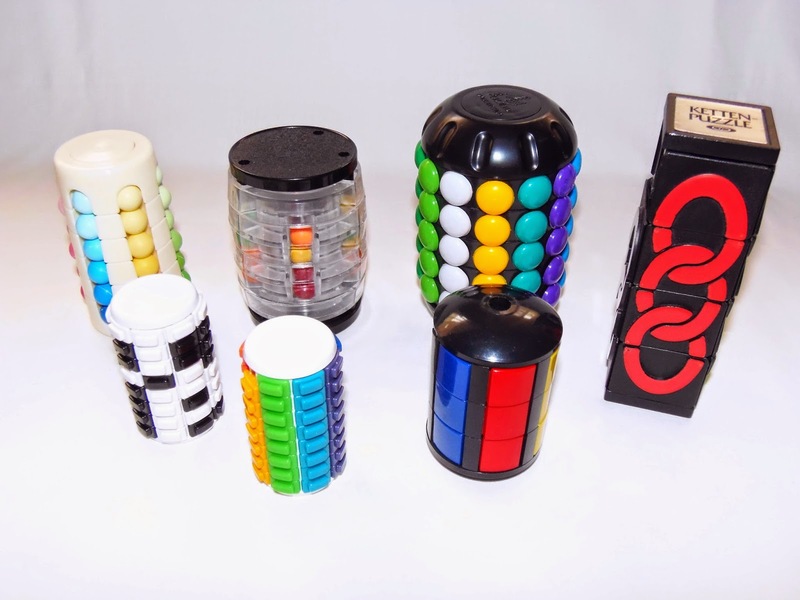 Why, they were all released in the same year, of course, in 1981 - The golden age of the Rubik's Cube. Ever since then, countless variations were made, in all sorts of shapes and sizes, some of them were pretty good, others, should've never seen the light of day... Unfortunately, the Circular Bean Tower by Muzi (a.k.a Capuzle), belongs in the latter group, but keep reading to find out why. 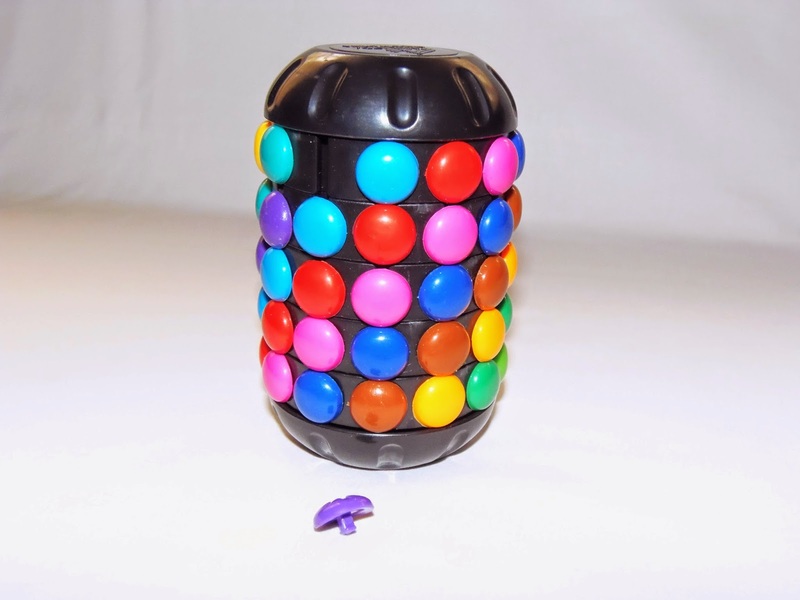 The design of the Circular Bean Tower is nothing short of ambitious: comprised by twelve columns and five rotating discs, for a whopping 60 beans total, you can be sure to have a huge challenge on your hands. To get an idea of the sheer size of the Capuzle, the original Babylon Tower had six columns with six rows, which added up to a total of only 36 balls. In theory, the difficulty is about twice as hard, but add the fact of the poor movement of the puzzle and that adds up to an infinite amount of frustration. 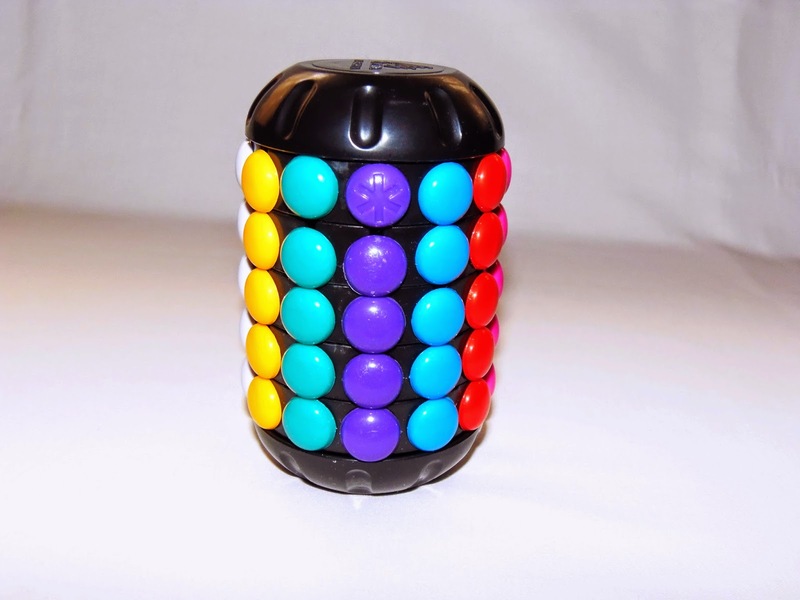 The goal of the puzzle is similar to any cylindrical sliding puzzle: remove the purple bean with a star and with the empty space you'll be able to mix the puzzle by rotating any of the five discs back and forth, and moving the beans up or down the columns. When you feel the puzzle is well mixed, try to get each column with a single color. The problem with this puzzle is its movement, which is very stiff. The rotating discs move relatively easy, but trying to get the beans up or down the columns is a major headache. Some beans can move effortlessly, but most of them get stuck and you need to apply a generous dose of force. Now, clearly the puzzle was not very well though-out, or the quality of the materials is subpar, or both. I can still give it the benefit of the doubt, as my copy could've been a faulty sample, but I'm sure there's more copies out there like mine and if so, let me know your experiences with this puzzle. As you can expect, I didn't spend much time playing with this puzzle, because it's basically impossible to find the patience and work around a stiff mechanism. I really wanted to like the Capuzle, because the design is very interesting and ambitious, but the poor mechanism eliminates all the fun out of it. Had the mechanism been functioning 100%, it could've been one of my favorite sliding puzzles. As for now, it will just be another puzzle taking up shelf space. 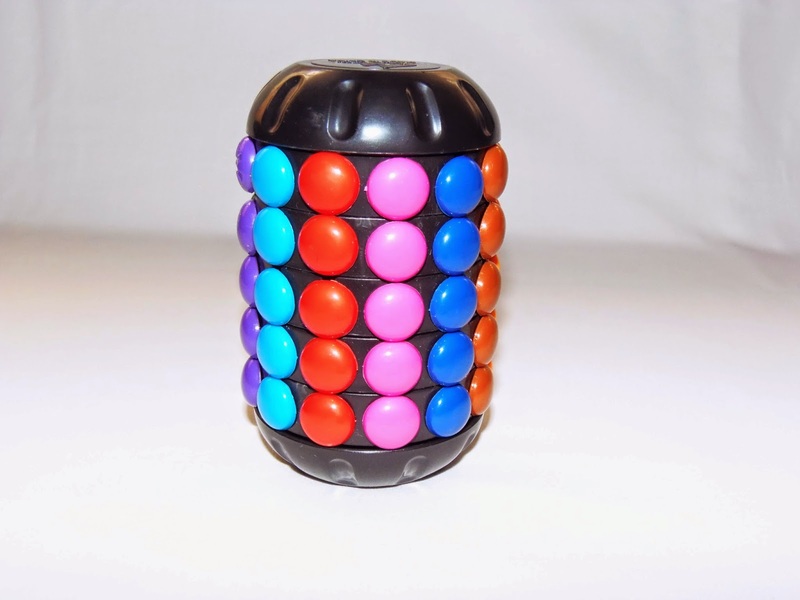 Availability: The Circular Bean Tower is available at PuzzleMaster for $11 CAD. 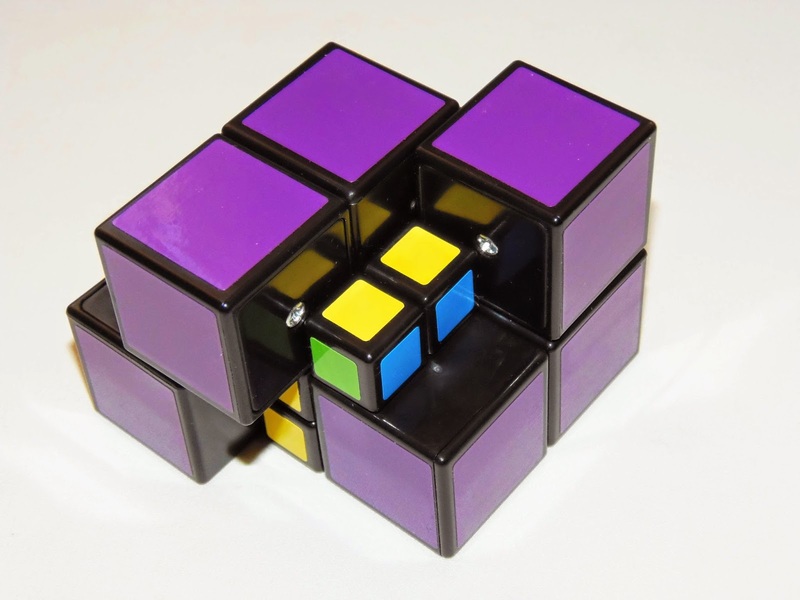 If you're an avid puzzle collector, like myself, you're bound to come upon similar concepts and ideas over the years, albeit sometimes presented with a different design, but still the general idea is there. This is exactly what the designer of the Caged Golf Ball - unknown to me - did. Is it worth it even if you already own a similar puzzle? Read on to find out. 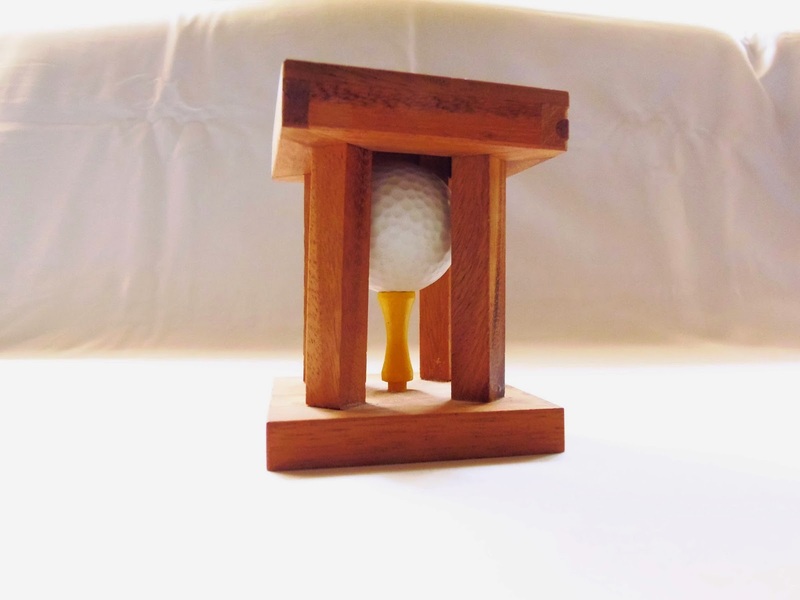 The Caged Golf Ball, as the name suggests, has a trapped golf ball enclosed between four wooden bars, apparently making it impossible to remove the ball, unless some kind of trick is to be performed. This is partly true, however it's not a trick per se, but a well known and simple force of physics that will certainly amaze anyone. The puzzle is made from monkeypod wood, a common type of wood used in more affordable puzzles, but don't be fooled by its low price tag. To be honest, I really like this kind of wood. It has this pleasant smell that will perfume any cupboard you put it in, and for an affordable type of wood, it gives a nice quality to the puzzle without appearing too cheap. It measures 10cm x 7.6cm (4" x 3"). Without revealing too much about the solution of the puzzle, which can be quite challenging for a casual puzzler, I can give you a hint that its principle is similar to a well-known Hanayama puzzle, the Cast News. If you haven't solved it yet, well, then I recommend starting with the Hanayama puzzle, since it's easier to perform the required moves, because it's made of metal. The wooden mechanism, as it's expected, doesn't work flawlessly, and even if you're doing the right moves, it may still prove inefficient. If you think you're doing the correct movement, keep at it and eventually you will unlock the mechanism and reveal the secret of the Caged Golf Ball. The difficulty of the puzzle is rated as a level 2/5, and this is true if you're an experienced puzzler, but if you're not, it can be as challenging as a level 4/5. 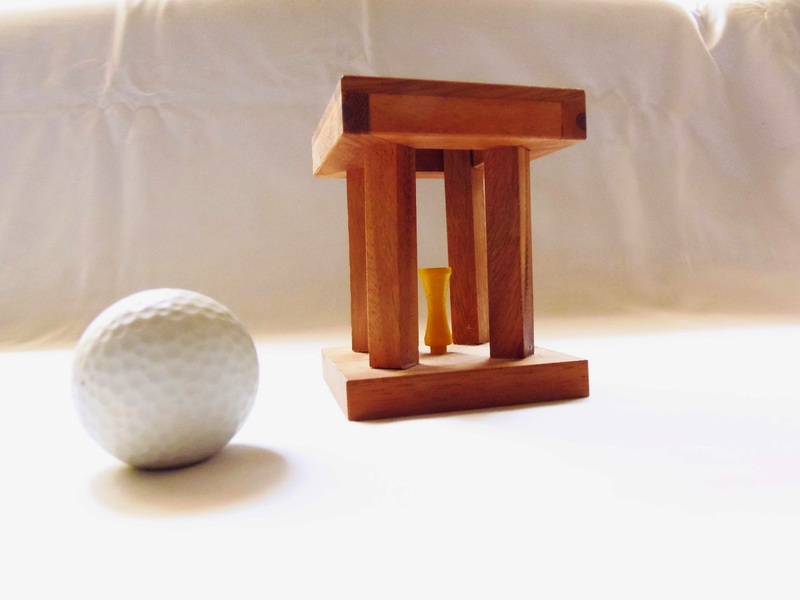 The perfect gift for a golf aficionado, the Caged Golf Ball can still be a great challenge for anyone interested in puzzles. Responding to the question above, yes, if you're a puzzle collector it's really worth getting this puzzle for its original and unique design, but if you know the basic principle behind it from other puzzles, or you're not into golf, then it's up to you, since it won't give you a proper challenge. Availability: As of the time of writing this review, the Caged Golf Ball is currently out of stock at Brilliant Puzzles. However, if you still want to check out other golf related puzzles, there's a few options available here.